“He shoots, He SCORES! 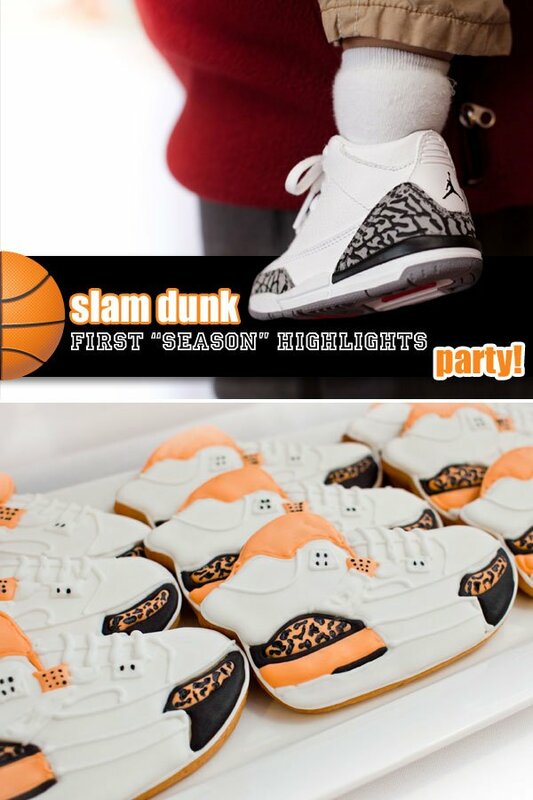 !” and we are going wild about this Basketball Themed Slam Dunk first birthday party by Andrea of Coquette Events. Following her clients lead, Andrea incorporated the family’s love for basketball and modern sense of style, while still keeping the party fresh and youthful. From the basketball cake pops and fondant cupcake toppers, to the concession stand food – which included fried chicken wings and hot dogs with all the trimmings and much more, the “first season highlights” photo bookshelf, to the amazing Mini Air Jordan Cookies, this party was a slam dunk! 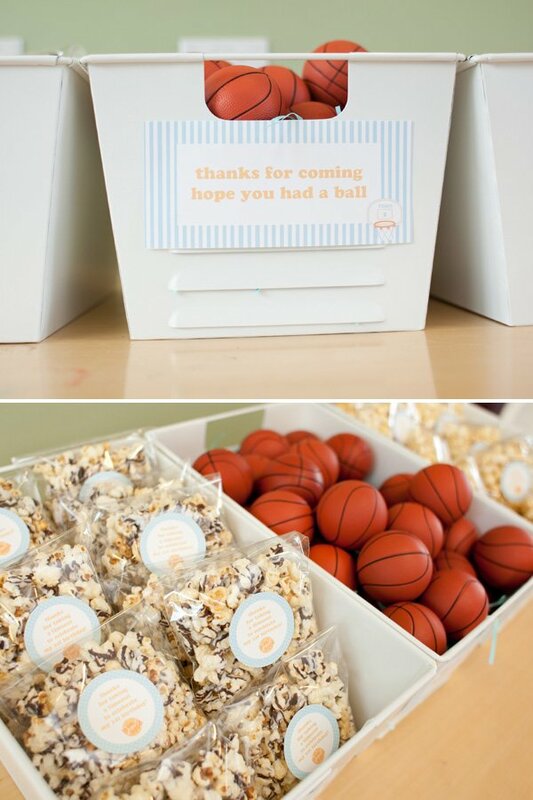 We’re also loving the super fun mini basketball and popcorn party favors and athletic storage bins which displayed them. Read on for more adorable & creative “First Season Highlights” and “Slam Dunk” pictures. 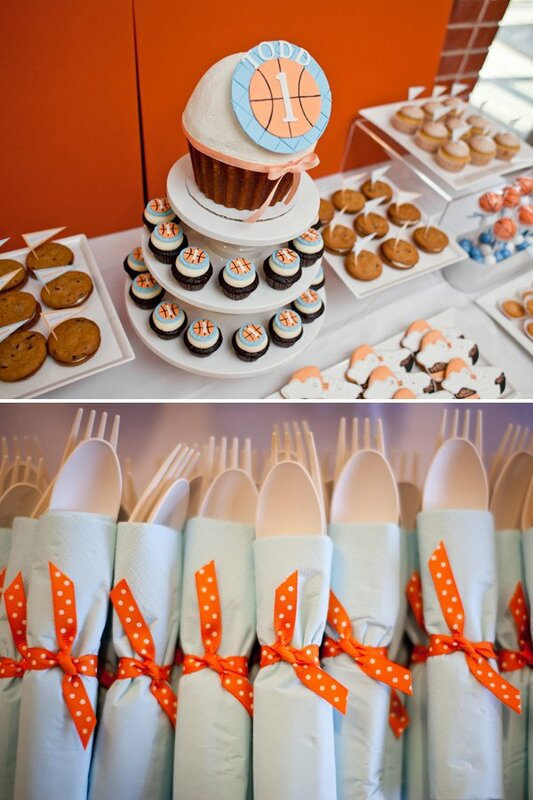 . .
“Our client came to us wanting a contemporary baby friendly party. As we discussed the different theme options, she kept going back to how much her husband loves basketball. So we decided on a baby blue, white, and orange color scheme. Thinking a soft print would help balance an orange basketball, we played around with stripes, polka dots, and finally landed on argyle and polka dots. 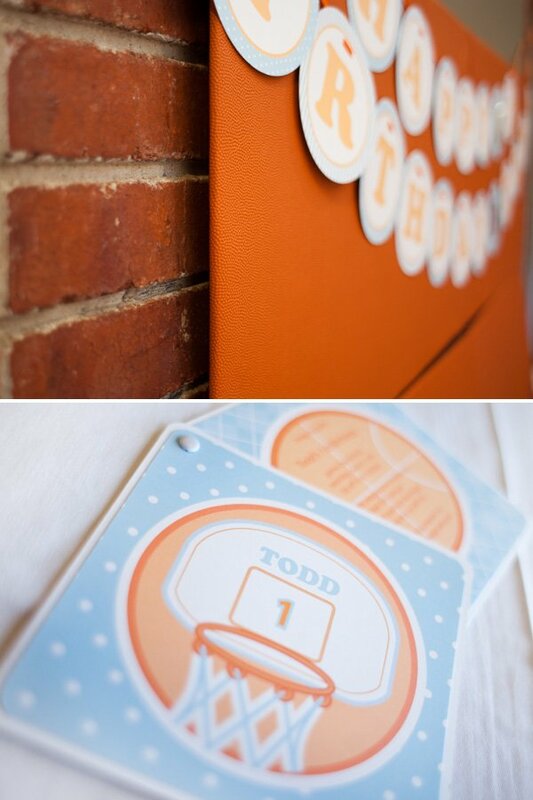 The prints acted as the background to Todd’s basketball backboard announcing his big birthday. 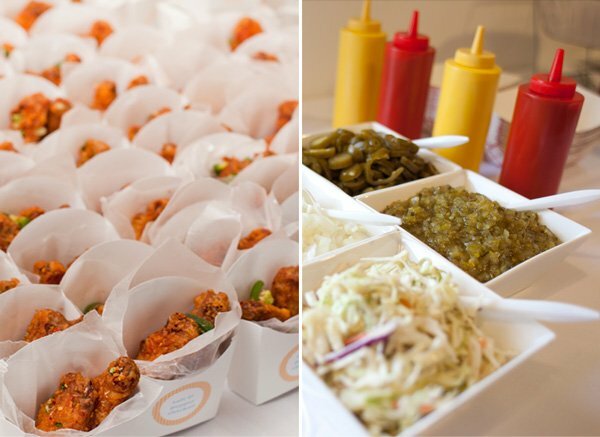 We carried the look of the invite throughout the party with a patterned banner and customized stickers for the concession stand inspired buffet. The menu included salt and pepper fried chicken wings (that were a huge hit), hot dogs with all the trimmings, chili over rice (daddy’s favorite), macaroni salad, and Japanese somen noodle salad. Todd’s photos were set up in a bookshelf to show “Todd’s First Season Highlights” with labels detailing his baby milestones. The dessert table was so deliciously pulled together, the guests were hesitant to start eating from it. Sweets were on the top of the priority list and we worked with two different vendors to pull it all together. Love Bites Bakeshop provided us with snickerdoodle cupcakes, which were topped with “Slam Dunk” and “Sweet Shot” flags, chocolate chip cookie sandwiches, and mini chocolate cupcakes that were topped with fondant toppers from Dream Cakes by Maggie. Maggie was also the talent behind the basketball cakepops, Todd’s giant cupcake smashcake, and the beautifully decorated sugar cookies. The sneaker cookies were inspired by Dad and Todd’s favorite basketball shoes. Mom added her own special dessert, Japanese mochi. The finishing touch was the backdrop, which was made up of foam boards covered with basketball textured vinyl. This is a very nice theme the shoes are adorable. I think this theme is amazing! 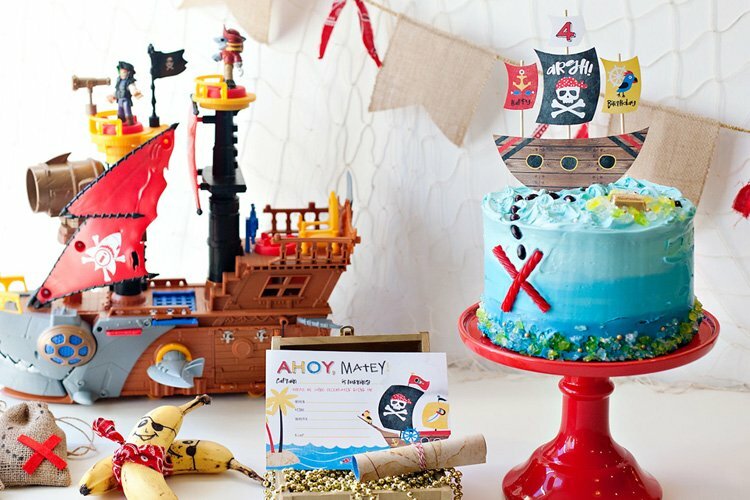 My son is only one month old and i’m already to plan his first bday bash using this very theme…. Very smart and creative two thumbs up! 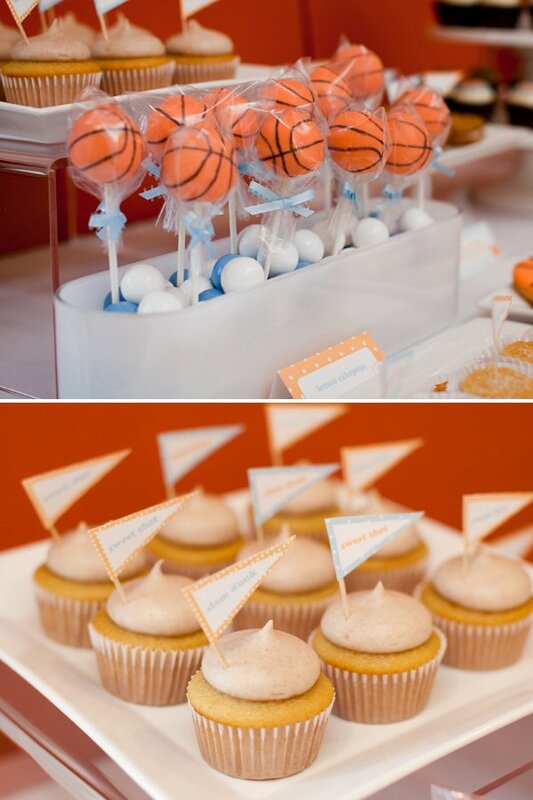 Those basketball cake pops are so cute! 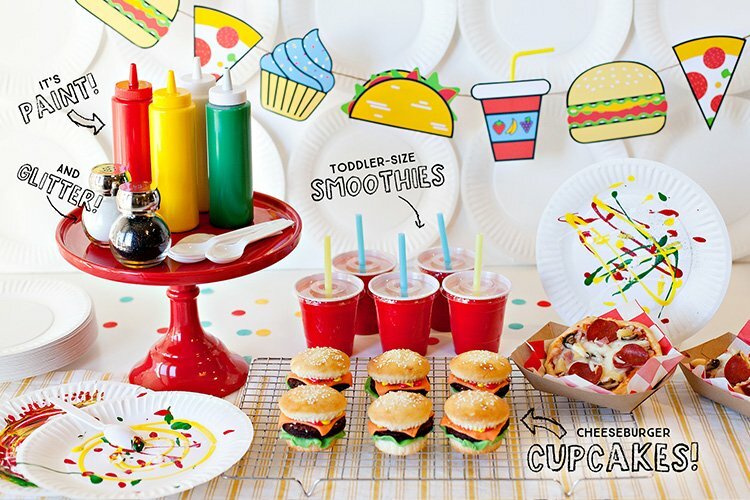 Love this birthday party theme! Yay for boys! Love it! Love all the little details. This was just too ingeneous, I love it!!!!!!!!! I love this awesome party………. I wish this were a baseball theme. I’m working on planning my sons first bday bash with baseball in mind. I think I can get a lot of ideas about it here but I’d LOVE to see a modern baseball theme. I wish this were a baseball theme. I’m working on planning my sons first bday bash with baseball in mind. I think I can get a lot of ideas about it here but I’d LOVE to see a modern baseball theme..
Where can I find the basketball material used for the board where the happy birthday sign is in the photo? Love all the details!! Can you tell me where you purchased the happy birthday banner, and the mini-basketballs? Where did you do your printing at? 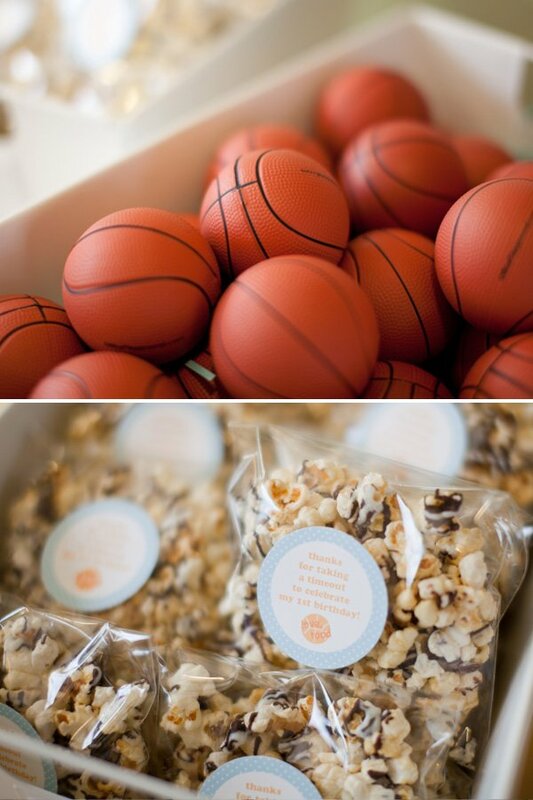 Can you send me the information on where you ordered the mini basketballs used as favors from? They are seriously the best cupcakes I’ve ever had!